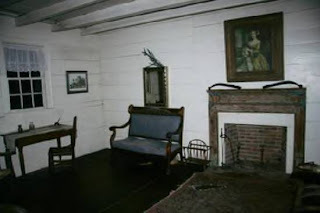 King's Tavern- Murder & Hauntings On the Natchez Trace. 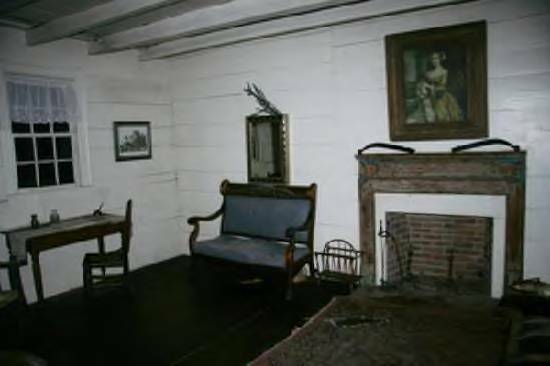 The first known owner of The King's Tavern was Ricardo King of Long Island New York, who's family gave the name to the Kingston settlement outside of Natchez. 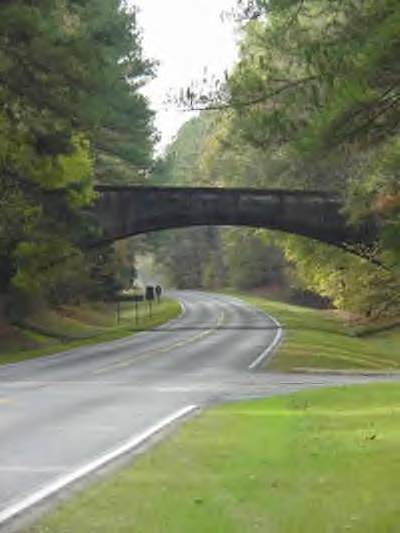 The King's Tavern site is located at the end of the historic Natchez Trace Parkway. A stretch of historic road that runs from Natchez all the way to Nashville, Tn. To venture along the Natchez Traceway was to journey into a wilderness of darkness and sometimes death. 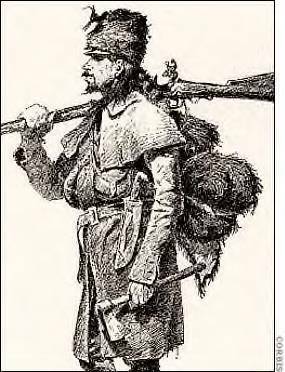 For 500 miles the passageway twisted through matted forests, boggy swamps and broken valleys where dangerous animals, wilderness and most frightening of all bandits and wild Indians were encountered. Crude taverns were erected sporadically along the Traceway, where one might find a greasy meal, a soggy cot or a lukewarm bath. Many preferred to rest in the open for fear of being robbed while they slept. Burying their money and belongings in the dirt, sleeping with their guns under their arms and lighting fires to ward off wild animals, hundreds of people died on the Traceway from exposure. Modern view of the Trace at right. Bad weather and frequent flooding of small creeks and rivers turned into torrents and flooded the trails, turning open passages into soggy bog land. Frequently stalling horses and wagons in the muck. But the greatest danger on the Traceway walked on two feet. The lonely roadway was a favorite for bandits and thieves. Bands of renigade Indians and Whites alike set up ambush along the Traceway looking to loot and plunder possessions, valuables and horses. Month after month, people disappeared on the Traceway, never to be seen or heard from again. It was not uncommon when a well known individual disappeared, that it was assumed or taken for granted that they had become a victim on the Traceway. The most well known death along the “Trace” is the 11 October 1809 death of Meriwether Lewis, Governor of the United States Territory of Louisiana. 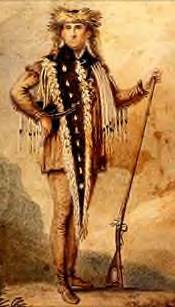 This man, famous as co-leader of the Lewis and Clark expedition, allegedly committed suicide at Griner’s Stand. Lewis’s traveling companion, Major James Neely, arrived at the death scene a few hours after the event. Major Neely wrote this to Thomas Jefferson: “It is with extreme pain that I have to inform you of the death of His Excellency Meriwether Lewis, Governor of Upper Louisiana who died on the morning of the 11th Instant and I am sorry to say by Suicide.” Still, there are many today who question the suicide, believing instead that Lewis was probably murdered.Throughout the years skeletons have washed to the surface from shallow graves or hunting parties have come across nameless corpses rotting on the edges of the bogs. At the King's Tavern, travelers told tales of ambush and horror on their journeys of the Trace. With drink in hand, new arrivals to the Tavern told stories of outrage and savagery , like stories of The Harpe Brothers, Mason and Murrell. At the head of the tales was Little Wiley Harpe and his brother Big Macijah Harpe, ( aka: William and Joshua Harpe) ,Notorious murderers and theives, who had little regard for human life and frequently killed for pleasure. Their deeds were so outrageous that even their allies in crime detested them. Originally from North Carolina, the Harpe Brothers were sons of a Tory. Their father was rumored to have sided with the British during the Revolution and was a frequent victim of barn burning and retaliation. Musgrave says that they emigrated from Scotland as young children and were first cousins, the sons of John and William Harpe, who settled in Orange County, North Carolina (Breazeale says Georgia), but other sources indicate that they were born in America, and that it was their fathers who emigrated, around 1761. The families were seeking to run a plantation, and did so for a few years before the colonies entered a war. At some point as they grew older the boys changed their names, from William and Joshua to Micajah and Wiley, dropping the "e" and passing themselves off as brothers. Instead of becoming farmers, they fought in the war, but not on the side of the struggling young country. On the contrary, they were young Tories, loyal to Britain, and they happily participated in rampaging gangs that terrorized and plundered patriots. Sketch of Wiley Harpe at right. The name Harpe aquired fame all along the Trace from the Tennessee Valley to the Natchez Bluffs. In the 1790's the Harpes also had a reputation as far north as Kentucky and were rumored to have used the Mammoth Caves in Kentucky as a hide out. They traveled with their women in tow, frequently enterchanged partners with each other when the mood struck. They joined with bands of Indian outlaws from time to time to burn farms, loot, murder and steal horses. The Harpes took lives for the sheer fun of it, sometimes killing their victims, gutting them and loading the abdomens with rocks in order to sink them in rivers and bogs. They moved from one state to the other, killing and robbing as they went. They not only killed for fun , but took great delight in torture and mutilation of their victims by cutting off fingers, poking out eyes with sticks and gutting their victims. They once tied a naked man to a horse and sent him reeling off a cliff to his death, for the fun of it. The Harpes also were no strangers to child killings. In my research I read accounts of the Harpes having killed a small child by cutting them into one inch pieces, On one occassion Big M. Harpe, exasperated at the crying of his own child, grabbed the child by the ankles and proceeded to bash the childs head into a tree until it shattered. Big Harpe claimed it was the only murder he ever committed that he actually regretted. On one occasion The Harpes were staying with friends. They were given a cot next to a mild mannered surveyor who snored to loudly while they slept, so they crushed in his head with a hatchet. Going down to breakfast, they offered to watch a woman's child so that she could get their breakfast made quicker, They quieted the child by slitting its throat in it's crib. When breakfast was served, the poor woman met her fate in the same way, with a butcher knife. After breakfast the Harpes burned the house down. Authorities offered a heavy reward for the pair, A vigilante group overtook Big Harpe, while Little Harpe managed an escape. Wounded and paralyzed Big Harpe was confronted by the husband of the woman and child they had savagely murdered. Big Harpe dieing to slowly for his taste was met with a butcherknife by the husband who slowly and methodically, cut and hacked at Big Harpes neck until he was decapitated. His head then stuck in the fork of a tree as a warning. It is said that the white skull of Big Harpe remained in the tree for many years. Little Harpe eventually returned to Natchez and joined forces with another criminal by the name of Sam Mason. A Virginian of higher breeding and class, but also a notorious theif and murderer. He was organized and planned his crimes, unlike the spontanious , hot headed Harpes. He had served in the Continental Army and some claimed he was a descendant of a signer of the Declaration of Independance. Sam Mason was also a frequent patron of the King's Tavern, frequently meeting with his accomplices and discussing his plans over a drink at the Tavern. Cutthroats and criminals of all kinds were patrons of the The King's Tavern, from horse theives and pick pockets, to slave runners, to murderers and rapest, and con artists. The King's Tavern was known for it's wild and rowdy patrons. It has been reported that Little Harpe was eventually captured and hung for his crimes on the Traceway. The King family was also rumored to have their own skeletons in the closet, or the chimney as was later discovered. Mr. King was rumored to be having an affair with a barmaid in the tavern by the name of Madeline. Mrs. King was rumored to have found out about the affair. Madeline mysteriously disappeared. In 1930, the Tavern was undergoing renovations and repairs. It has been reported that 3 skeletons, one woman and two men, were found encased in the chimney of the downstairs fireplace. Not far from the fireplace a pearl handled dager was found, possibly the murder weapon. It was suspected that the skeletons were that of the missing Madeline, and either her killers, hired by Mrs King and later disposed of to cover herself, or two male slaves that Mrs. King had issues with. The King Family sold the tavern in 1817 to The Postlewaite family, who owned the tavern for another 125 years. 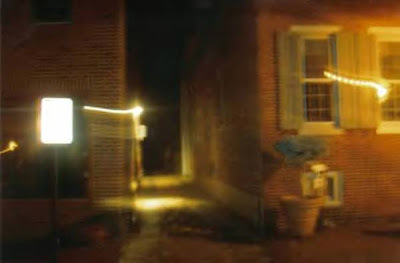 There are numerous reports of paranormal activity in the tavern, sources report that scores of witnesses have seen images of a young female, believed to be the ghost of Madeline, the slain mistress. She appears at odd times and is sometimes a prankster, knocking jars off of shelves, pouring water on the brick floors, turning the lights on and off, and breaking glasses. Some have claimed to have witnessed tables vibrating, chains on the walls moving by themselves, Footsteps, when no one is there, water taps turning on by themselves, sounds of a baby crying in the attic room, maintained by the legend that Big Harpe had killed another baby in the upstairs room becasue he was annoyed by it's crying. 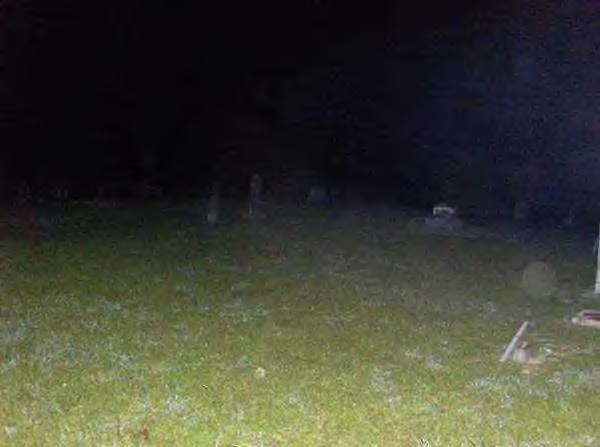 There are also claims of seeing a man with no face wearing a red hat, hearing male voices talking when no one is there and the shadows and apparitions of both a large man and an Indian. The King's Tavern is open to the public for dinner dining. The MSSPI Founders had the pleasure of dining at the King's Tavern on our trip to Natchez on November 21, 2009. I have to say , it was the best prime rib I ever ate and well worth the trip. The staff was very hospitable and eager to share their paranormal experiences. We were given a brief tour of the Tavern and while we were in the upstairs bedroom quarters it was pointed out that there were wet footprints on the floor in the guest suite bathroom. Now the management claims that these footsteps appear frequently and that this is a paranormal event. 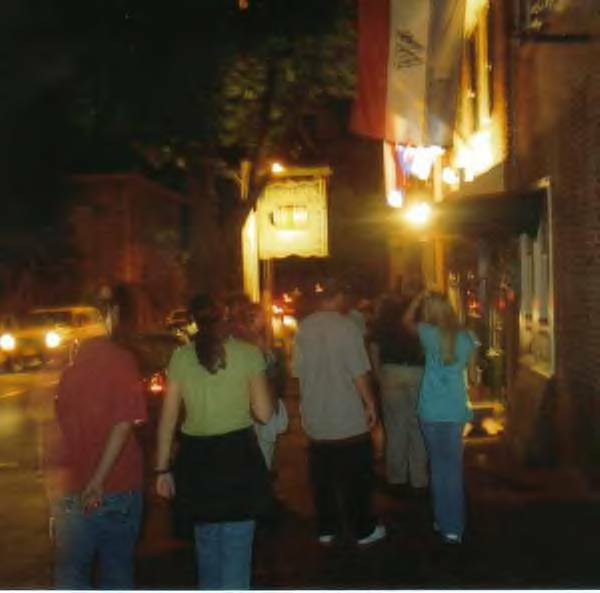 Since we did not have a controlled enviroment in which to investigate these claims at the time, we cannot say one way or the other if this was a paranormal event, but we had a wonderful time hearing all the stories and eating at the fantastic King's Tavern. We encourage you to visit if you get the chance. 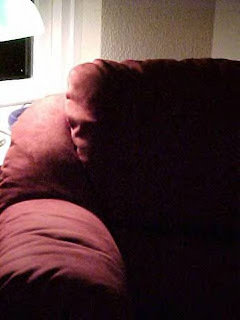 When first looking at this photo you may think "Oh my god, there`s a face in this couch!!". But is it really there or is this an illusion? I must admit that this image is quite eerie, but I would be inclined to say that maybe this is an illusion. After all, it is a proven fact that the human brain is programmed to pick out faces from inanimate objects, but that doesn`t necessarily mean that all faces we see are illusions. 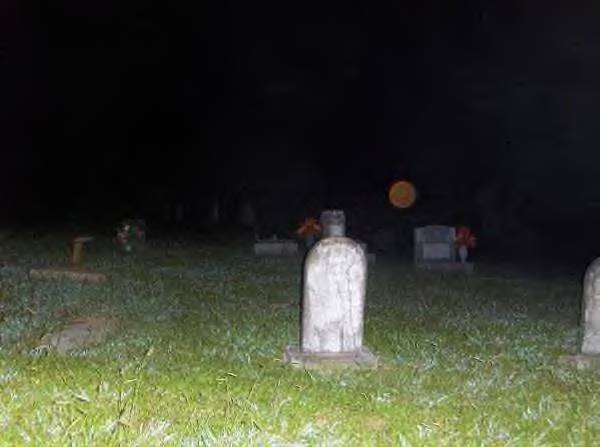 Orbs are showing up in photos all the time. 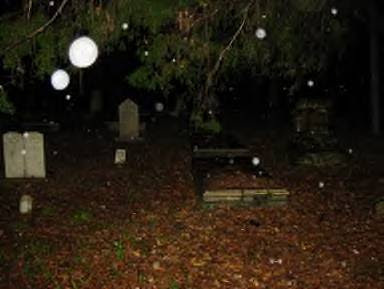 Many believe that orbs are spirits that do not possess enough energy to form as a full apparition & orbs are often present with spiritual activity. 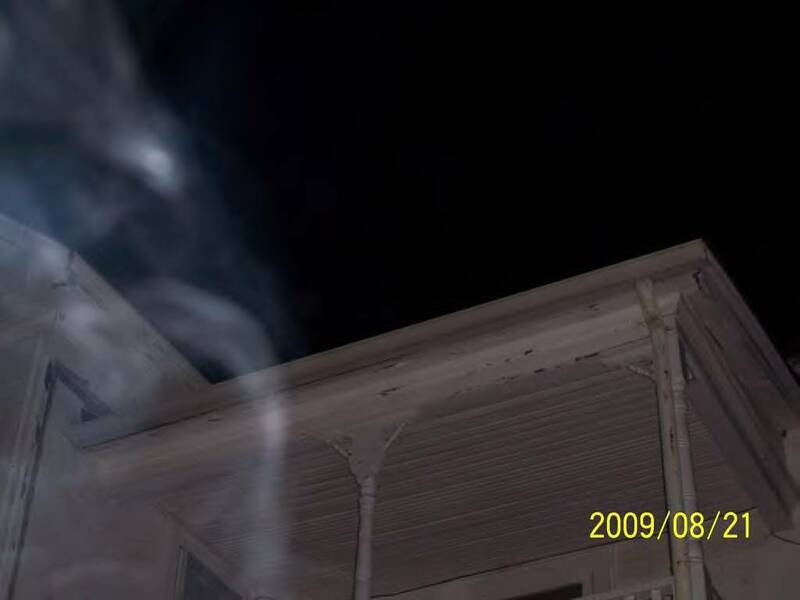 But, probably 90% or more of orb photos are nothing more than a malfunction or a reflection . In the photo at left , you see orbs everywhere, but it`s not spiritual activity. 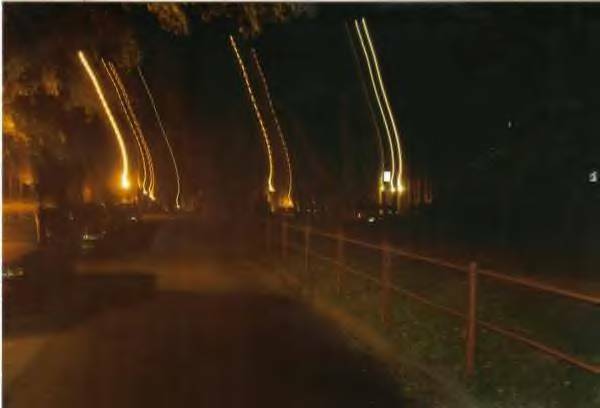 These are dust particles in the air that the camera flash is reflecting on. 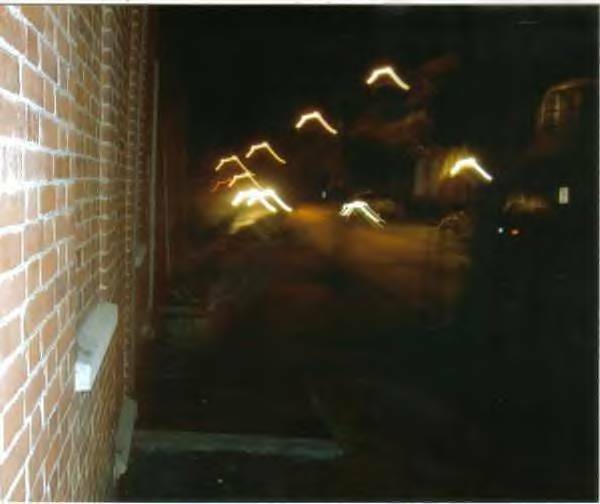 The following photos are some experiments MSSPI members have done with our cameras in order to recreate images that many people present as paranormal evidence. This photo gives the appearance of snake lights. but is in reality the effect of walking past an area and snapping a picture without stopping, which I have seen many people do, especially on walking tours. Photo by Angela L MSSPI 2007............ if you don't have a tripod, at least stop and stand still LOL. 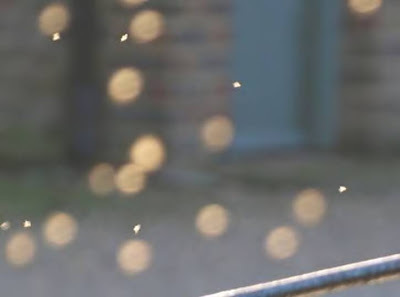 Bugs, taken from the ASSAP News website. on an article about orbs. 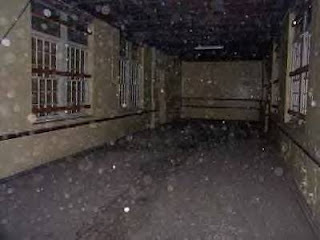 This is particles of baby powder which had been placed on the floor by the client, in order to see if there were any foot prints coming out of the bedroom. 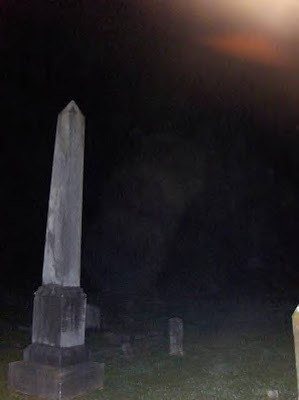 This brite winged orb is in fact a dragon fly which followed me around while I photographed this cemetery. We hope these examples will be of some value to you in helping you with your own photos. While this is just a drop in the bucket to explaining odd photos, we have tried to pick some of the more common examples that are frequently passed off as paranormal photos. MSSPI does not condone or support the activities or beliefs of the Ku Klux Klan and we provide this information for research and information purposes only. 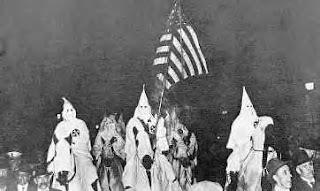 The Ku Klux Klan has struck fear in the hearts of thousands of people since it's formation on December 24, 1865. Many sources site that the organization was originally formed by Confederate Officers as a social club and to help support the widows and orphans of the Civil War. However, other sources dispute this as being a cover for it's original intention which is said to have been political and racist in nature. The original six founders of the Ku Klux Klan were Confederate Veterans of the Civil War, Capt. John C. Lester, Maj. James.R.Crowe ,Adj. Calvin Jones, Capt. John B. Kennedy, Frank O. McCord and Richard Reed. Capt. Lester suggested forming the club. Capt. Kennedy mentioned kuklos as part of the new club's name. Maj. Crowe suggested changing it to "ku klux". Lester, then suggested adding "clan" to the name. John Kennedy repeated it and became the first man to speak the words "Ku Klux Klan". 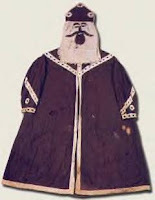 Crowe suggested using costumes to make the club more mysterious. Capt. John C. Lester, born, 1834, Giles County, TN. Died Dec. 4, 1901, Hartsville, TN. Buried in Maplewood Cemetery, Pulaski, TN. Served in the 3rd Tenn. Infantry. He practiced law for a while, never married, and was a Christian (denomination not presently known). Maj. James R. Crowe, born Jan. 29, 1838, Pulaski, TN. Died July 14, 1911. Buried in Maplewood Cemetery. Served in the Marion Rifles, Co. G, 4th Alabama Infantry, later served with the 35th Tenn. Infantry. He attended Marion Military Institute and was a prominent factor in business and political life in Tennessee. A Free Mason, he attained the rank of Most Illustrious Grand Master of the Grand Council of TN. in 1866. He was a Cumberland Presbyterian. Adj. Calvin E. Jones, son of Judge Thomas M. Jones, Born 1839. Died 1872, Pulaski, TN. Served as adjutant of the 32th Tenn. Infantry. He was a lawyer and a member of the Episcopal Church. Capt. John B. Kennedy, born Nov. 6, 1841, Wales, Giles County, TN. Died Feb. 13, 1913, Lawrenceberg, TN. Buried in Monroe Cemetery, Lawrenceberg. Served in the 3rd Tenn infantry. His widow was present in Pulaski, TN. on May 21, 1917, when, amid much fan fare, the plaque, commemorating the law office where the KKK was founded, was placed on the outside wall of the building. Officiating at the ceremony was Mrs. Grace Neufield, former Tennessee state historian of the United Daughters of the Confederacy. Kennedy attended Center College, Danville KY.
Frank O. McCord, born Jan. 14, 1839, Giles County, TN. Died Aug. 19, 1895, Fayetteville, TN. 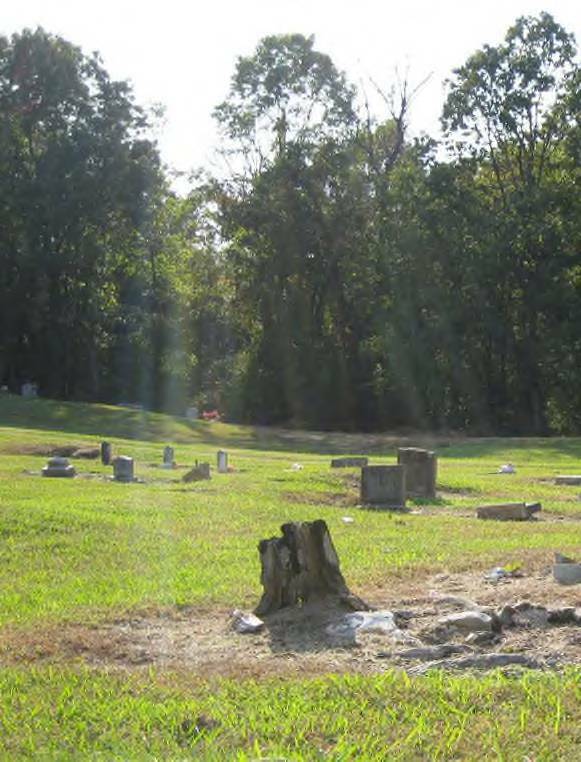 Buried Rosehill Cemetery, Fayetteville. Served as a private in the Confederate Army and later became editor of the Pulaski Citizen. He was a member of the Methodist Church South. Richard Reed, was a lawyer in Pulaski, TN. and served in the 3rd Tenn. Infantry. He was a Presbyterian. The Ku Klux Klan was formerly recognized in May of 1867 near Nashville, Tn. and it was at this time that General Nathan Bedford Forrest was elected Grand Wizard. Groups of the Klan began to form all over the South. However, it was soon to be recognized as a society of terror as racist violence began to escalate by klansmen. 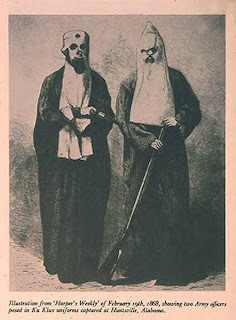 Ku Klux Klan Costumes, 1868, The KKK's hooded costumes were meant to protect the anonymity of its members and promote fear of an "unknown" terror among blacks. The costumes were also crucial to the KKK's desire to invoke the rituals and traditions of secret white, male brotherhoods of the past. Source: Stanley Horn, Invisible Empire: The Story of the Ku Klux Klan, 1861-1877 (1964). Other sources say that they had adopted the wardrobe of a spook or ghost as a scare tactic to frighten superstitious freedmen and it was said that this idea was attributed to being the ghosts and spirits of the Confederates soldiers who had died during the Civil War, come back to seek their revenge. Some sources say that this scare tactic was intended to deter newly freedmen from exorcising their new rights to vote and to run the Republican Party out of the offices of the Southern States. 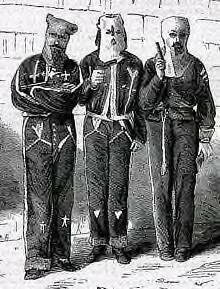 In 1868 the State of Alabama Congress documented 109 murders by Grand Wizard John Morgan's Knights. Klansmen also burned the County Courthouse in Greene County and 3 African American schools. Georgia in the same year reported 31 killed, 43 shot, 5 stabbings, 55 whippings and 8 floggings of 300 to 500 lashes given to individuals alone. In Camellia Ga, 7 dead and 30 injured. Mississippi's Grand Dragon James George, targeted African American schools and carpetbag teachers. The Meridian Riots of 1871 started at the County Courthouse, killing one judge and 8 African American witnesses. Texas klansmen collaborated with the Knights of the White Camellia and the Knights of the Rising Sun. Union General John Reynolds found murders of freedmen in Texas " so common as to render it impossible to keep an accurate record of them. Kentucky klansmen burned Shaker homes at Bowling Green and spent much of their time defending moonshine stills. At Herrodsburg alone, there were 25 murders and over 100 floggings. South Carolina klansmen killed 12 Republicans in the Lauren Riots of 1870 on the eve of the State elections. York County klansmen killed at least 11 people and flogged 600, burning 5 schools and churches. In Columbia County Arkansas, under the direction of Grand Dragon Robert Shaver, 10 were reported dead in a 3 week time span. Lafayette County Ga, saw 20 murders in one month. In Louisiana the numbers were staggering with 1,081 murders, 135 shot or wounded and 507 assaulted. In Jackson County Florida, 179 murdered including 2 Republican Clerks and the Klan's first Jewish target, liberal merchant Samuel Fleshman. Some sources say that Grand Wizard Nathan B. Forrest disapproved of these violent activities and attempted to disban the society in 1868, however, their nightly raids of terror continued. Much of the Klan violence was targeted at African Americans who attempted to vote and Republican's seeking election. It did not matter what race you were, if you assisted these groups or supported them in any way, you were a target, white or black. Steps were taken to curb this violece with the 5th Amendment of the US Constitution which promised a vote to former slaves. Congress next passed a series of Enforcement Acts, first in 1870, which applied stiff penalties to anyone convicted of conspiring to deprive any US citizen of sufferage or any other civil rights. The 2nd Act enacted 9 months later placed federal authorities in charge of voter registration and balloting in Congressional Elections. In April 1871, the Ku Klux Act defined Klan violence as rebellion against the US permitting the President to declare martial law in troubled areas. Ulysses S. Grant launched a campaigne which indicted 1849 persons in South Carolina, 1180 persons in North Carolina and 930 persons in Mississippi. Lesser numbers were indicted in 4 other states. But in Tennessee, only one person was ever convicted, 14 faced trial in Florida with only one conviction . Alabama and Georgia together faced 160 Klan indictments in 1871, but none of them ever went to trial. 262 were convicted in Mississippi including 28 who plead guilty to murder. All of them recieved suspended prison sentences after promising to quit the Klan. 57 were imprisioned in South Carolina's York County but 162 of those indicted for serious crimes were never tried. In 1872, there were 65 Klanmen in Federal Prisons and all of them were paroled or pardoned by 1875. 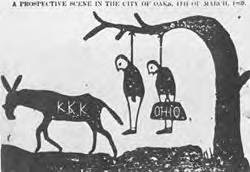 In 1873, although the group had been formerly disbanded, scattered Klan violence continued by various groups. In Colfax Louisiana, the courthouse was burned and more than 60 were slaughtered. In 1874 60 Republicans were massacred at Coushatta. In New Orleans 27 murdered, 105 wounded. In August of 1874, 16 were lynched in Tennessee and in December of that same year 75 Republicans were massacred at Vicksburg. Between 1883 and 1915, over 3200 were lynched. Not a single indictment was returned during this time against killers, who often boasted of their crimes and posed for photographs with their victims. Between 1913 and 1915 Hollywood would play a hand in the regrouping of the Klan. The Birth of A Nation would hit the silver screen. 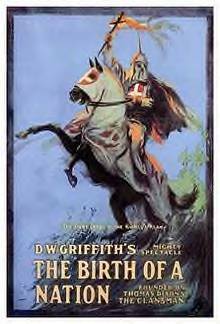 This 12 reel film , directed by David W. Griffin and based on the book The Clansmen by Thomas Dixon, was first exhibited in 1915. It opened to the public at New York Liberty Theatre on March 3 and became one of the biggest money makers in film history. The apparent racist tone of the film along with the sympathetic treatment of the Ku Klux Klan would be strongly protested by African American Leaders and Northern Liberals. Along with the influence of the movie, other events would also bring a rise to Klan activities. In 1913, Mary Phagan, a thirteen year old girl, was murdered in Atlanta at the pencil factory where she worked for Leo Frank. Leo Frank was a Jewish businessman from New York. An African American man was originally suspected of the crime. But he saved himself from lynching by incriminating Leo Frank. Frank was spared from the gallows by flimsy evidence, but Georgia's Governer commanded his sentence to life in prison. In August 1915, Leo Frank was lynched by a mob who called themselves the Knights of Mary Phagan. 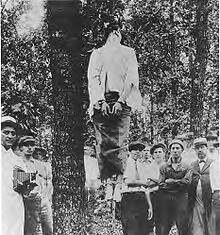 Lynching of Leo Frank at Right. On September 2 1915, Thomas Watson called for a new KKK in Georgia. the Knights of Mary Phagan climbed to the top of Stone Mountain in Ga and lit America's first fiery cross. But the honors for the rebirth of the Klan would be given to William Joseph Simmons 10 days after the cross burning on Stone Mountian. Simmons and 34 others including two of the original Klansmen and 7 of the Knights of Mary Phagen would answer the call to regroup. On Thanksgiving day 1915, Simmons was sworn in as Imperial Wizard by the original founders of the KKK who were present. Most Americans think of the Ku Klux Klan as a Southern institution, mainly targeting African-Americans. However, in the years following the First World War, the Ku Klux Klan enjoyed a nationwide revival wielding considerable influence in the North and Midwest, as well as the South. This so-called "Second Klan" aimed its propaganda not only at African-Americans, but also at Catholics, Jews and "foreigners." In 1920s Maine, the African-American and Jewish populations were quite small, where they existed at all. There can be little doubt that the Klan's main focus in Maine was Catholic "foreigners," the vast majority of whom were the relative newcomers from Québec. The Second Klan was part of a wider Nativist movement representing a backlash against the wave of immigration, much of it from southern and eastern Europe, which was perceived as a threat to the Anglo-Saxon Protestant character of the United States. The Second Klan was also largely an opportunistic money-making scheme perpetuated by shrewed businesspeople exploiting the mood of a country seeking a return to "normalcy" following an unprecedented World War. In 1923, Dr Hiram W Evans, a dentist, is said to have tricked Simmons out of his seat as the Imperial Wizard. He would rule the Klan for 16 years, stepping down in 1939. Under his leadership the Klan reached its height and would also begin it's decline. From 1939 to 1944 the Klan would be run by Dr. James A Colescott, a veterinarian, who increased the Klan membership, added many reforms and some say could have maintained the Klan as a legitimate fraternal order. However being unable to pay alledged back taxes, he ordered the Klan's disbandment. Dr. Samuel Green, an obstetrician, revived the KKK on Stone Mountain, Ga. in 1944. He restructured the Klan as to avoid any claims the IRS might make concerning the more then quarter million dollars the Klan allegedly owed. He did this by claiming the Klans in each state were independent and only connected as Klans of association. 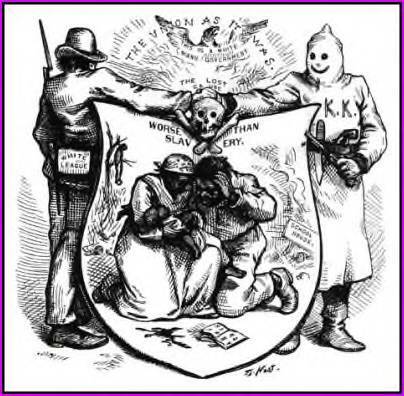 To back this up Green took the title of Grand Dragon (a state leader) instead of the national title of Imperial (or Grand) Wizard and he named his revived Klan the Associations of Georgia Klans. But, he was the recognized head of the Klan's third incarnation. Eldon Edwards, an Atlanta auto worker (paint sprayer), ruled the KKK until his death in 1960. He reorganized the KKK again and named it, the US Klans. By 1957, Edwards'' Klan had 50,000 members. The seven other existing Klans at the time totaled 50,000 members combined. So, by 1957, there were 100,000 Klan members. During his reign people began to realize that when the Klan lost all their copyrights after its 1944 disbandment there was no longer any legal protection on the name of the Ku Klux Klan, its emblems, or regalia. Everything had gone into public domain and anyone could now use whatever they chose. Thus, totally unconnected independent Klan groups began to appear. The "Ku Klux Klan Movement" has never been united ever since. These separate Klans were often bitter rivals of each other. 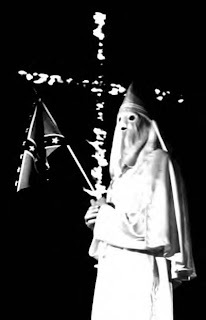 With no unifying national control these various Klans went in many different directions, some continued on as fraternal orders, others became more political, but with the 1950's advent of the Civil Rights movement, some Klan groups became murderously savage groups which did much to destroy the Klan's reputation as a whole and to lead to its eventual near destruction by the end of the 1960's. Edwards' death in 1960, launched a power struggle in the Klan. Robert M. Shelton, a used car salesman, emerged the victor when in 1960, he managed to unite most of the Klan factions into the United Klans of America. He ruled his Klan until its forced disbandment in 1987, after it lost a 7 million dollar lawsuit. To combat the Civil Rights laws of the 1960's his Klan actually tried to take on the federal government in some ways and committed many acts of law breaking and violence. After the violent 1960's, Shelton's UKA, like all other Klans, was pounded to a pulp by the numerous federal crack downs and its once proud membership had shrunk to around 2,000. A figure they managed to keep, more or less, until the end in 1987. James R. Venable, an attorney, was a personal friend of Col. Simmons and Dr. Green. His family owned Stone Mountain, the scene of the Klan's two revivals. The Klan group he eventually founded was called the National Knights of the Ku Klux Klan, which he ran until his death in the 1990's . To his credit, he ran his Klan much like the Simmons Klan with its regalia, emblems, degrees, and Klankraft virtually intact. Being an attorney, he also kept his Klan relatively out of trouble. Unfortunately for him, his Klan also went into decline as a result of the bad image the violent Klans had given to all Klan organizations. After the general decline of the late 1960's, Venable's Klan settled down into a private fraternal social club Klan. When he died his family folded the National Knights. Since then the name of the National Knights has been picked up and is being used by others. Samuel H. Bowers, a saw mill owner, ran a major Klan group, the White Knights of Mississippi, but its power and membership were mostly limited to the state of Mississippi. Bowers commanded tremendous power in his home state and literally launched a murderous reign of terror against the Civil Rights movement there. He took on the full power of the federal government doing irreversible damage to the reputation of all Klans as a result. William M. Chaney, a one time deputy sheriff and constable, split from the UKA and founded the Confederation of Independent Orders, Invisible Empire Knights of the Ku Klux Klan which began growing to reasonable size. He ran his Klan as a republic with each state having considerable autonomy. Unfortunately for him, his Klan went defunct when he lost a court appeal in 1977, concerning a bombing incident. William Wilkinson, ex-submariner, founded his Invisible Empire, Knights of the KKK in 1975. He was often described as a media slick southerner. He was later repudiated as an FBI informer. During the 1970's and early 1980's, his Klan was among the four largest. When Wilkinson stepped down in 1983, his Klan went defunct from fragmentation and incredibly corrupt bad leadership. Don Black succeeded Duke as Grand Wizard and promptly went to prison when he attempted to take over the government of a small island country in the Caribbean Sea. His Klan had a brief success when they won the hotly disputed Gulf Shrimp Boat Crisis, but he proved to be a hot headed leader. While in prison, his trusted seconds in command ousted him. Stanley McCollum then took over the Knights of the KKK group and held it together for eight years. Under his leadership it went into great decline and faded away. By the 1980's, all but three of the Klans that existed up to and during the 1960's had vanished. As in the 1950's and 1960's, new Klan groups came and went in the 1970's. Some didn't last long enough to get noticed outside of their local areas. The same continued throughout the 80's, 90's, and to this day. Contrary to modern myth the KKK was never a bunch of ignorant rednecks. Many sophisticated famous, prominent, and historically significant men and even women ( pictured left) joined the Ku Klux Klan and became its leaders. Some of the prominent men who were members of the original KKK were: General Robert E. Lee, whose statement: "My support for your organization must remain completely invisible." inspired the Klan's nickname: "Invisible Empire. ", General John C. Brown, Captain John W. Morton ,who became Secretary of State of Tennessee, Ryland Randolph ,editor of the Independent Monitor, General George W. Gordon, General John B. Gordon ,Grand Dragon of Georgia and author of the Prescripts of the KKK, General W.J. 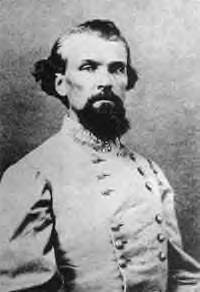 Hardee, author of many of the warnings and oaths of the KKK, Colonel Joseph Fussell, General Albert Pike chief judicial officer of the original KKK and a major figure in Scottish Rite Masonry, and Edward White, Supreme Court Justice under the Wilson administration, he was a member of the original KKK, Air Force General Nathan Bedford Forrest III ,Grandson of Grand Wizard Forrest and Grand Dragon of Georgia for the revival Klan, he was killed by the nazis during World War II. Other notable men were: President Warren G. Harding. He was sworn into the Ku Klux Klan in the Green Room of the White House by Imperial Wizard Simmons. President Woodrow Wilson and President McKinley. Little is known of their Klan membership. McKinley was a Union officer, but many Union men joined or affiliated with the original Klan during the Radical Republican's anti-white Reconstruction Era. Wilson would have been a member of the Klan under Simmons. President Calvin Coolidge. He allowed cross lightings on the Capitol steps and reviewed the giant Klan parades of 1925 & 26. President Harry S. Truman was a minor ordinary Klansman from 1920-22. His membership was not notable. He later had a major falling out with the KKK over his desire to appoint Catholics to key political positions; something the KKK opposed at the time. He severed all ties with the KKK and openly repudiated them. His family has tired to deny his KKK membership ever since. Supreme Court Justice, Hugo Black, his robes (with his name in them) were found in an old Klan Hall in the 1960's. Under political pressure, he superficially repudiated the Klan during its period of scandals. Senator Robert Byrd, West Virginia, Democrat, was a Kleagle and Exalted Cyclops as a young man. He spoke favorably of the Klan during his political career. Gutzon Borglum, who carved Mt. Rushmore, Stone Mountain, and did work on the base of the Statue of Liberty was a prominent life member of the KKK. He sat on the Imperial Koncilium in 1923, which transferred leadership of the KKK from Col. Simmons to Hiram Evans. Under media pressure he superficially repudiated the KKK. It is also a misconception that the KKK used the Confederate flag as one of it's symbols after the Civil War. It was not until the mid 1960's that the Confederate flag was taken into use by some of the KKK Chapters. Since the creation of the Ku Klux Klan the American Flag has always been displayed at Klan functions. 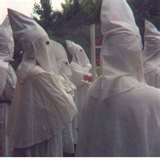 The present day KKK is not one organized group but is composed of many independant chapters across the US. Some of these groups have adopted the the look and emblems of neo -Nazis and white skin head groups. On Nov 14, 2008, an all white jury of seven men and seven women awarded $1.5 million dollars in compensatory damages and $1 million in punative damages to plaintiff Jordan Gruver, against the Imperial Klans of America. After he was savagely beaten at the age of 16 at a Kentucky county fair in 2006. This is just a small amount of history of the Ku Klux Klan. However there are many books and websites that contain a more detailed history of this group and the atrocitries that have been committed by its members since it began. Further Reading and Source Materials. The International Encyclopedia of Secret Societies & Fraternal Orders by Alan Axelrod 1997. Hooded Americanism: the History of the Ku Klux Klan by David M Chalmers 1987. Invisible Empire: The Story of the Ku Klux Klan by Stanley F Horn 1939. The Great South Carolina KKK Trials of 1871 & 1872 The Mississippi Quarterly 1997 by Raymond Arsenault.